Look, it’s the full moon, it’s technically half a month in a lunar cycle, so what the hell. Thought I’d give the ritual a try to see how it goes. Clearly it worked, as I had Bast chatting to me constantly in meditation. Khonsu, too, feels a lot like Amun, but there was definitely a strength there, too. He and Bast danced on the shores of Bakhu. They were having a great time. Djehuty just sat beside me and watched it all. I’d forgotten how much I love His quiet, knowing presence, even if His mental voice has now shifted for me into a old slightly grumpy slightly posh British dude. He did find that amusing. I haven’t actively included Him in my rituals for a very long time, other gods kept stealing all my time, but it’ll be nice to get back to doing ritual with Djehuty. I miss Him. Bast gave me some choice advice about ancestors and kings and just going to shrine to talk to them every day. She said a whole lot of other things, too, but those are the things I remember most. Khonsu said He wanted me to do ritual for Him at the full moons, too. That’s His time. Which makes me wonder about sticking to the lunar cycles for now, just while I work on the rest of the calendar, and then I’ll only have one half-month to worry about. Anyway. It’s late, and I should head to bed, but I wanted to at least write about this ritual, since it seemed to go so well. 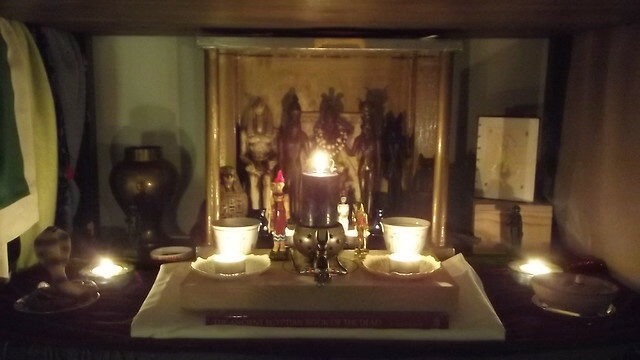 Looking forward to trying out the rest of my household rituals and seeing how they settle into my practice. It has been a very intense Deipnon this month. For the first time, I could feel things other than the gods around when I went to meditate, and fought one of them with my knife. I warded the grove where I usually meet Hekate, and once that was done, we could talk. I am grossly oversimplifying this, but it’s late, and I don’t have the time to write about it now. The restless dead were very present, and that’s a new experience for me. I wasn’t afraid, just weirded out. But then I was with Hekate, and it was okay. It was then that I became aware that some of the dead were those killed in Orlando, and through Hekate, they helped me figure out the last little pieces I needed to do ritual for them, which I do owe them. So they’ll get offerings tomorrow for noumenia, then a proper ritual later in the week. I’ll also do the 70 day prayers for them. Which makes me think it might be time to bring back the 6th Day Ritual, and begin monthly offerings to the ancestors. I might rejig the ritual I used to use, because it never really felt complete enough. I’ll set it for the sixth day after noumenia. I’ll start with the queer ancestors, and see where we go from there. Anyway, have a video of my shrine from tonight’s deipnon. IDK why I’ve felt drawn to video my shrines now when I’ve never done that before, but okay, sure. This seems to be my thing for the moment. Apologies for the shakycam, didn’t have time to correct/redo because it’s late and I have work tomorrow, so. Offerings of bread, honey liqueur, water, and incense. A thousand of every good and pure thing on which a god lives. Go, rise, return to the starry heavens. Shine out from the belly of Nut on the horizon. May you go well with the gods in peace. I still don’t really know what to say. It still doesn’t feel real. I actually didn’t realise how much I cared about him, and loved him, until he wasn’t there anymore. So many others are more articulate than me, and probably have a better sense of what to write about him. But I just have no words. I’m just drowning in his music, and crying. It seems to help, just a little. I probably never struck anyone as a Bowie fan. I generally kept that to myself. I got into him late, and never really dived in and obsessed about him the way others did. But I always liked his music. I admired him as a storyteller, and a musician, and someone who could do things I could never imagine. His music moved me, and amazed me, and made me dance and smile. I adored his queerness. And I adored Labyrinth. And now he’s not there anymore, and it doesn’t feel real. I think I was another person who felt he was somehow immortal. Bowie doesn’t just die. It just. My heart is breaking. But only Bowie could say goodbye like that. What a way to go. I picked up Blackstar only a couple of hours before I found out he’d died. And it really is a magnificent album, particularly listening to it now. It’s glorious. What a way to die. My gods. And so the 70 days begins. 68, if I count from the 10th. I may build a tiny shrine. I may write something. I don’t know. Nothing seems adequate to mark his passing. But I’ll still count the days, and perhaps by the time I get to the prayers, it won’t hurt as much as it does now. Well. I guess that’s the trans* elevation rite done for this year. I pulled Thorn yesterday when I checked my runes to see if I should do the elevation rite yesterday, and when I asked again today whether I should keep going and finish the rite during the next week, I pulled Thorn. Again. So. I may still do something small for the Trans Day of Remembrance, but it’ll probably be fairly simple. Offering water, lighting incense, reciting the names, etc. But I won’t continue with the elevation rite. I’d been contemplating it all day, and I had a niggling sense that I should probably stop. General purity issues aside, I just wasn’t sure it was worth continuing this particular ritual, for this particular set of ancestors, while I was menstruating. It felt potentially triggering to those spirits I was trying to help; whether this would be the case, I don’t know, but better safe than sorry. I’ve moved the shrine to my ancestor shrine. I’ll do any TDOR stuff there. I’ll also check beforehand if they want me to do anything, just to be on the safe side. We’ll try again next year and see if my body behaves.